Chris Pratt was recently interviewed and confirmed that Guardians of the Galaxy Vol. 3 will start filming in January of 2019 and might have also revealed a spoiler for Avengers 4. The news that Pratt is returning to Guardians of the Galaxy also reveals that Star-Lord will return after the events of Infinity War like Peter Parker and Drax the Destroyer. However, the actor isn't sure where on the timeline Guardians of the Galaxy Vol. 3 will fall, which leads to questions about Avengers 4. Chris Pratt will be back for Guardians of the Galaxy 3, but will he be included in Avengers 4? 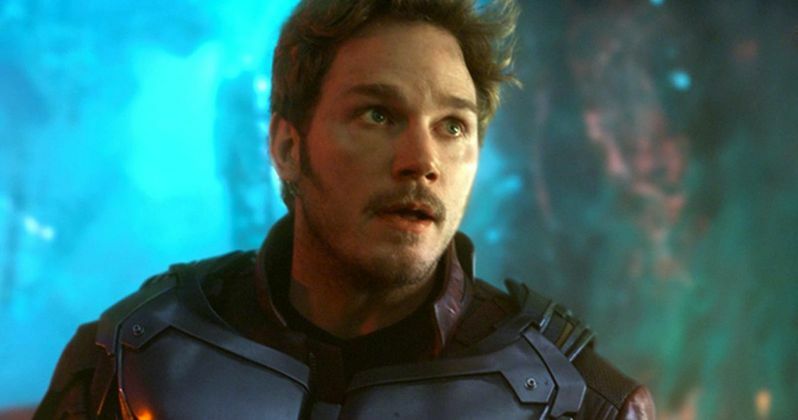 It's been implied that Star-Lord will be back, but Pratt has raised some interesting questions to where the next Guardians movie will fall in the Marvel Cinematic Universe timeline. He also revealed that it could be the last time that we see Star-Lord in the MCU. Pratt explains. "I'm slated to film Guardians of the Galaxy Vol. 3 in January, so we don't know yet, time-wise, where that lines up. I'm hoping it's not the last time you'll see me (in the Marvel Cinematic Universe), but I can't be sure." It's entirely possible that the death of Star-Lord at the snap of Thanos will remain in Avengers 4. Guardians of the Galaxy Vol. 2 took place years before Infinity War, so it's quite possible that Guardians of the Galaxy Vol. 3 could take place before as well, setting the movie up to be a prequel to Avengers 4. The Russo Brothers have said that the deaths in Infinity War are final, which may lead to a skeleton crew for the Guardians. At this point in time, it seems that the exploration of the Quantum Realm in Ant-Man 2 will play a large part in Avengers 4, leading to a journey through time and space to reverse the snap of Thanos. Time travel was the guess from most fans of the MCU, but it seems that some interdimensional travel will be closer to what actually happens in the final movie of phase 3. The real question will be how they implement the Quantum Realm in Avengers 4 and who is able to come back. Dave Bautista revealed that he's in Avengers 4 and Guardians of the Galaxy Vol. 3, but he didn't reveal the circumstances. They could be flashbacks for all we know, so it will be very interesting to see how the Russo Brothers along with Stephen McFeely and Christopher Markus chose to deal with the dark events of Infinity War. One thing is for sure, we won't be hearing anything about the official plot until the movie is ready to be released, which unfortunately, isn't for another year. You can check out the rest of the interview with Chris Pratt on Guardians of the Galaxy Vol. 3 and Avengers 4 below, thanks to the MTV International YouTube channel.